‘There is something to see!’ I exclaim to Thilina. ‘Pardon, Mister Lee?’ replied the startled pool bar attendant. I quickly caught my breath and repeated, in my perspired state, what I thought was breaking news. ‘Noooooooooo!’ he said, beaming, before putting oranges in the blender. It was evident that Thilina was humouring me as he kindly served up my regular fruit juice, yet his facial expression was altogether different three days earlier as he stepped off the train at Galle. 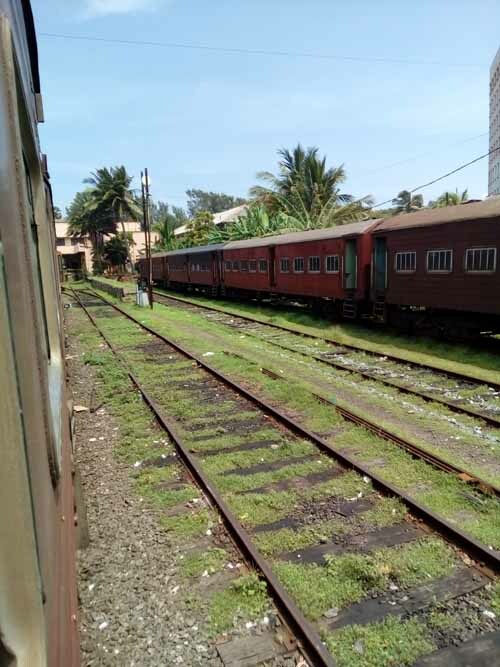 Back then, on Friday afternoon, Thilina was travelling home on the 12.12pm service from Ambalangoda, the nearest station to Hotel RIU at Ahungalla Beach on the southwest coast of Sri Lanka. I didn’t see the slim, six-footer on the platform since I misjudged the time it’d take Krishantha – our rotund and reliable tuk-tuk driver – to traverse the six-odd miles. 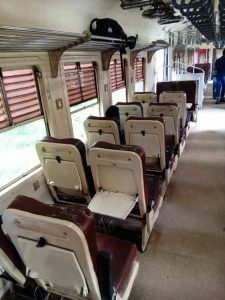 The train from Colombo was running 15 minutes late, thankfully, but the custom of selling tickets only moments prior to departure tested the stress levels of this usually care-free passenger. 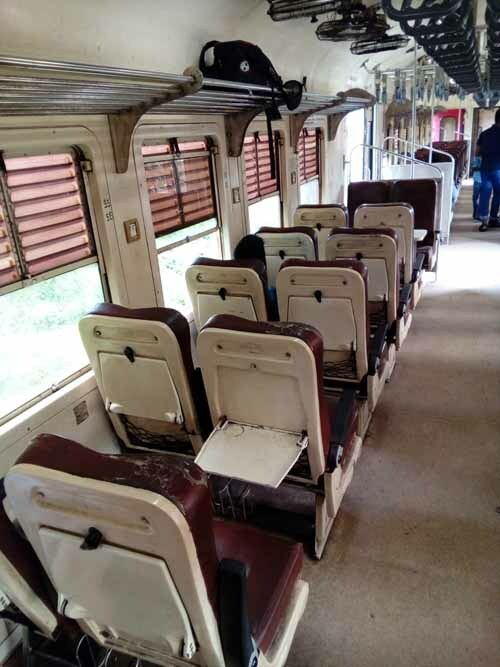 Second-class carriages are spacious and – notwithstanding ineffectual rusty roof fans – air-conditioned (due to lax health and safety standards surrounding windows and doors). The thirty-minute journey to Galle is as colourful as my recent hour-long one between Bratislava and Vienna was dull: while the latter area is hardly a concrete jungle, the former could easily be mistaken for a jungle-of-sorts with its rich flora and fauna. A group of backpackers – after loading each other up like packhorses – disembarked at Hikkaduwa though it was when pulling into Galle that Thilina, standing between two carriages, noticed me and approached. ‘You not getting off?’ he snapped. ‘No’, I sheepishly replied, before confirming if this “Colombo Commuter” continued to Matara, 28 miles further down the line. Although Thilina answered in the affirmative, his bewilderment caused me to doubt my Michael Portillo-like desire for conquering new railway journeys. Levison Wood is not even met with this response when walking, I thought to myself as the period of silence approached thirty seconds. It was the fact fortified Galle proved so underwhelming that led me to venture where – according to DK Eyewitness Travel Sri Lanka – ‘few tourists stop’, but I wasn’t going to mention this because it would’ve fallen awkwardly upon the Gallean’s ears. 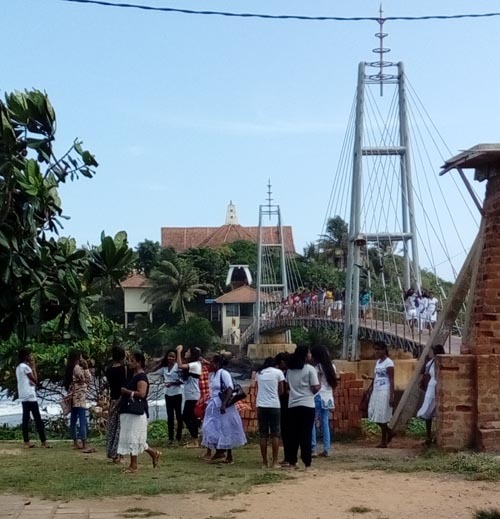 The standout attraction in this authentic and atmospheric old fort area is Paravi Dupatha, a sacred temple for Buddhists, yet one which non-Buddhists evidently find attractive since I spotted women in Muslim headscarves crossing its graceful cable-staged footbridge alongside orange-robbed monks. Given the deadly anti-Muslim riots of 2014, and what feels like a manufactured peace in nearby Dharga Town and in cities further afield, it was refreshing to see these two communities coexist in genuine harmony during my weekend sojourn. I said as much to Thilina on Monday morning but he intoned in reproof that I’d favour Kandy, even Colombo, never mind Galle, over Matara. When I remarked that I’d already visited all three yet favoured Matara he, once again, replied ‘Noooooooooo!’ This time, however, I feared Thilina was not humouring me.